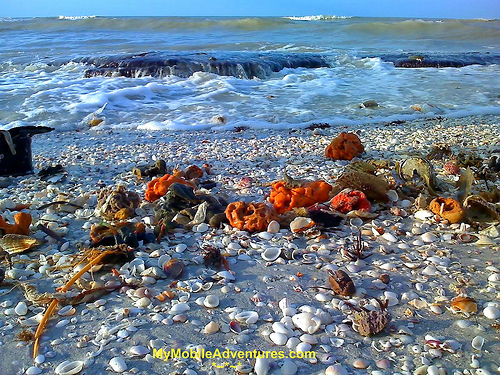 Sea sponges, shells and other fun stuff rolls ashore at “the rocks” on one of Sanibel Island’s West Gulf Drive beaches. Wow, what colorful shore finds. I love them and surely you captured them so well. what beautiful color on the beach. I’ve never seen such an assortment of stuff washed up in one place! Love this shot, amazing colors on the beach. Beautiful shot! I love the contrast of colors. I was on Sanibel once but didn’t see a sight like this, great. that’s gorgeous–the waves and the colorful shells and sponges! This makes such a lovely image! Treasures from the sea! What a great shot. I’m oohing and aaahhing at how many shells are there. I rarely see anything like that on our beaches here (at least the ones I visit). Yep, I really must visit Sanibel Island one of these days. You’ve convinced me. Ah, the detritus one finds on a natural beach. Wow, looks like the waves are really rolling in. Love the bright oranges. Tink: Your name is posted on many of the blogs where we land. Glad to find your virtual home. Great Watery Wednesday photo! great beach pickings! we winter on Hilton Head and lately there has been nothing to collect from the beach! I collect sea shells and rocks. Oh my goodness got to put Sanibel Island on my bucket list for sure. This is a beautiful photo! But I don’t think I would want to walk on that beach. The gifts of the sea huh? Great shot — I love the collection of beach items and the action of the incoming waves. Nice. Haven’t we been there at the same time? What an amazing photo — absolutely stunning! I wish that I was there today and not here…. What a beautiful site, I would have a ball going through all those treasures. Thank you for sharing. That is an amazing amount of shells and stuff on that beach! Hi Tink, this is such an awesome shot, absolutely stunning! What a beautiful photo! Thanks, Tink! Hello Tink, when we were young growing up in Miami, we would go shelling on Sanibel Island. Nothing was there except the beauty of the water and shells. Your photo is awesome. The island is so different now but still beautiful. That’s so colorful! How pretty. Paljon on rannalla tilpehööriä ja värikästä, ovatko jotai mereneläviä? the number of shells r unbelievable!